Prolong the life of natural and synthetic brushes with a product that stiffens and re-shapes bristles without harming the brush or the environment. Once your brush is clean and all paint has been removed from the bristles, dip it into Brush Shaper. Using your fingers, re-shape the brush to its original form and set it aside to dry. 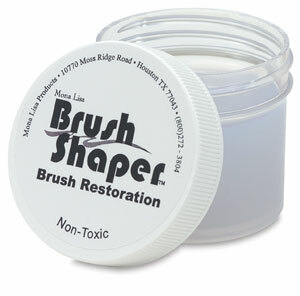 ™ Mona Lisa is a trademark. Brush Shaper is a trademark.